Phoenix is the name of a city; Phoenix is the name of a bird rising from the ashes; Phoenix is the name of a book about a man who lived in Phoenix and whose spirit is rising from his ashes spread on the top of Squaw Peak near Phoenix. Sometime around 1979 or so, David Gordon and the co-author went to an Erickson training seminar. This was the time period that Gordon was touring the country with Richard Bandler doing seminars on hypnosis. Richard would come out and befuddle everyone till they were laughing themselves silly, then David would come in, try to be funny and sober everyone up by explaining what Richard had just done. I took their 6 day hypnosis seminar in the summer of 1980 and my vision of hypnosis and NLP has never been the same. It was in this seminar they first taught the process of "chaining." 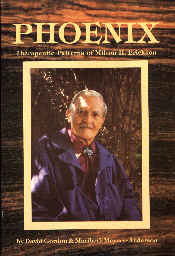 The book "Phoenix" reflects this interest on Gordon's part. The book consists of transcriptions of metaphors Milton Erickson told during a teaching seminar. I have reviewed audio tapes of 3 different Erickson seminars and find it very valuable to have a good transcription of these metaphors that are sometimes impossible to hear due to background noises and Erickson's speech difficulties. The metaphors are sorted into several David Gordon maps, then the reader is instructed how to recreate the process using these maps (models). This makes it appear to me to be a trivialized "1, 2, 3 ...NLP" approach to therapy, but I can see the benefit to novices in Ericksonian techniques to have a step-by-step procedure to follow. One caveat to the reader ( which Gordon omits- probably never occurred to him): the stories that Erickson tells (and, in particular, his choice of stories) are designed to train the participants in the seminar. Thus Erickson is cooking the seminar members by tales of cooking previous patients. To analyze tales of cooking rather than the cooking itself is to miss an essential aspect. The result is that the choice of wording, which Erickson always chooses carefully, contains embedded commands that will be custom-tailored for the current person(s) being cooked. A Freudian analyst writes that in his teaching seminar Erickson savagely attacked Freud's methods and humiliated the analyst. To the other seminar participants that attack had a different meaning than to the analyst who discovered first hand what it was like to be abused by a parental figure. That was what he had asked Erickson to help him to understand so that he could deal with Multiple Personality Disorders, which commonly stem from extensive abuse as a child. "Phoenix" seems more useful as a Milton Erickson teaching seminar transcription, than for learning to do Ericksonian techniques. The processes of Erickson that come through the seminar are more valuable than the processes supplied by Gordon-Anderson.